A portfolio of creative work is a requirement for admission to the majors in Architecture or Interior Design at Miami University. A portfolio is a collection of work that demonstrates something about you that your quantitative ratings (grade point average, rank in class, test scores) cannot reveal: your potential for creative studio work. We believe that we can make a better judgment about your talent and your ability to work productively in a studio setting by looking at art projects and other evidence in a portfolio than by relying on your academic record alone. A portfolio may be comprised of many kinds of work. It should include reproductions of drawings, prints, graphic design, painting, sculpture, ceramics, or photography. It may also include examples of architectural designs and models, set design, fashion or costume design, or anything else that you have made in an art class, summer exploration program, or on your own. One or two samples of mechanical (CAD) drawing may also be included, but this kind of work is less important to us than open-ended creative work. We suggest that you consult with an art teacher whom you trust in order to decide which works to reproduce for inclusion in your portfolio. Although we are interested in students with experience in a variety of media, it is better to submit a few works of high quality than many works of varying quality. If, for instance, your freehand drawing and watercolor painting are excellent but your graphic design work is mediocre or poor, we suggest that you submit only the drawing and the watercolor items. The portfolio committee is interested in reviewing your highest quality work. You may also want to consider participating in Miami's Summer Scholars Program. Students who complete this program will create content that can be included in the application portfolio. What is the portfolio format? Preferred Method: Submit digital portfolio images using Slideroom. There are instructions on the site. Mailing Method: We can also accept a digital print format. The pages should be 8 1/2" x 11" printed at the highest resolution possible. When is the portfolio deadline? Your application for admission to a major in Architecture or Interior Design is incomplete until your portfolio arrives. Late portfolios will only be considered on an as-needed basis. Portfolios submitted in non-conforming formats may not be considered. Please include return postage and a mailer, if you wish your portfolio to be returned. Please Note: If you are undecided about majoring in Architecture or Interior Design, it is in your best interest to submit a portfolio by the appropriate deadline anyway. You can choose a different major later, if you so desire; but you will have a limited opportunity to declare the major if your portfolio is submitted late. Students who apply to Architecture or Interior Design who do not submit a portfolio will be given the status of Undecided in the College of Arts and Sciences, NOT the College of Creative Arts. The status of Undecided in the College of Arts and Sciences will not give you access to studio courses in the College of Creative Arts. The Department of Architecture + Interior Design currently offers several scholarship awards based on the merit of portfolio submissions. 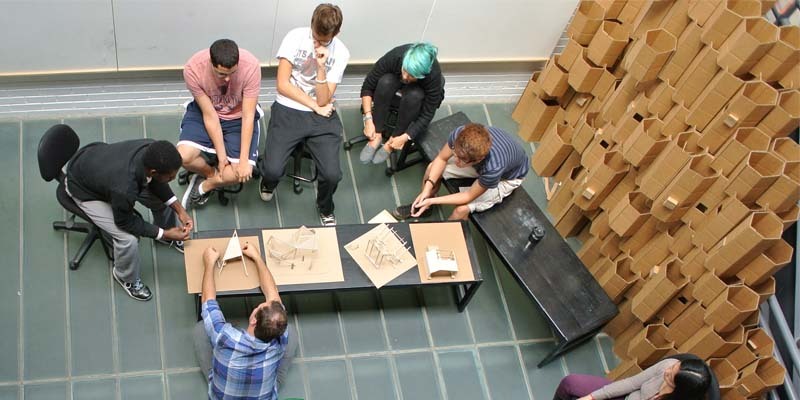 Portfolios of all students admitted to majors in Architecture or Interior Design and submitted prior to the January 31 deadline are considered for portfolio scholarships. If you have questions about the portfolio requirement, please contact the Department of Architecture + Interior Design at (513) 529-7210, or email the department at arcid@miamioh.edu.